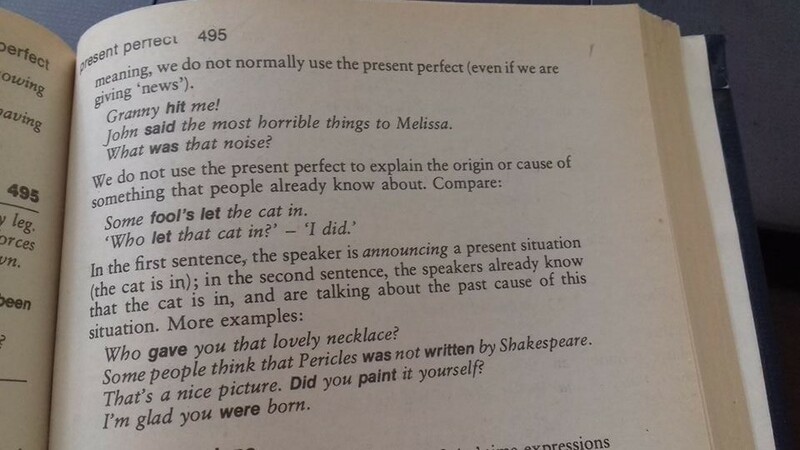 Not so long ago, I came across a grammar book, in which the present perfect tense was explained differently. It states that – "when we can not make a present tense sentence with a similar meaning, we do not normally use the present perfect (even if we are giving " news "). Especially if the impact of the hit is visible on the body? Can we remember this as a rule of thumb? Does it sound okay to you? We normally use the present perfect when we are thinking about past events together with their present results. I can't come to your party because I 've broken my leg. Some fool has let the cat in. That's a nice picture. Did you paint it yourself? So, it seems like a good rule of thumb to use the past simple when the speaker's focus is on the cause and the present perfect when the focus is on the result. Why are you crying? ~ Granny's hit me again. The again here seems to imply that the speaker's focus is on the repetition of the action rather than on its perpetrator. Hence the present perfect sounds acceptable. The book you are referring to gives a summative assessment of Present Perfect far from the madding pedantic analysis. In the four differences you have mentioned from the authority, the recurring theme is that it has a present relevance. And exactly that's what your grammar book says. With the help of two negative sentences the writer affirms this relevance of present in present perfect. When this relationship with the present is gone, it becomes the thing of the past. Present perfect is at the threshold,— one step in the past, one step in present looking forward but no step further. Not the answer you're looking for? Browse other questions tagged present-perfect simple-past or ask your own question.